We’d love your help. 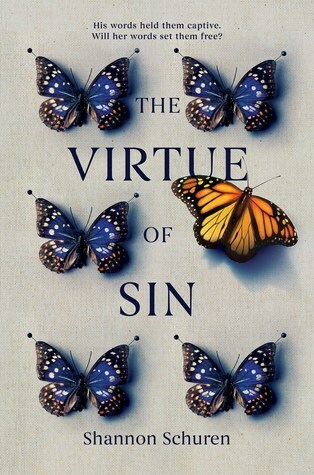 Let us know what’s wrong with this preview of The Virtue of Sin by Shannon Schuren. A novel about speaking out, standing up, and breaking free. Miriam lives in New Jerusalem, a haven in the desert far away from the sins and depravity of the outside world. Within the gates of New Jerusalem, and under the eye of its founder and leader, Daniel, Miriam knows she is safe. Cared for. Even if she’s forced, as a girl, to quiet her tongue when she has thoughts she A novel about speaking out, standing up, and breaking free. To ask other readers questions about The Virtue of Sin, please sign up. Oh, yeah. Give me a book about a cult and I will devour it in no time, which is pretty much the way I read Shuren's fabulous YA story about love, growing up, independent thinking, and breaking free of dogma. Reminds me of a wonderful quote from Richard Dawkins: "There is no such thing as a Christian child; only a child of Christian parents." This is an important story for so many reasons, but Dawkins sums it up best. Oh, the things we do to our children. Thank you to Shannon and Penguin Random Hou Oh, yeah. Give me a book about a cult and I will devour it in no time, which is pretty much the way I read Shuren's fabulous YA story about love, growing up, independent thinking, and breaking free of dogma. Reminds me of a wonderful quote from Richard Dawkins: "There is no such thing as a Christian child; only a child of Christian parents."